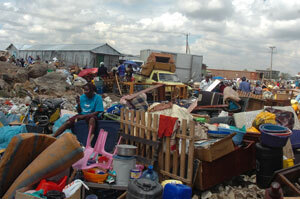 Kyang’ombe slum which is situated around the Jomo Kenyatta International Airport has been demolished. According to JKIA officials, the slum sits in the direct flight path, which poses a great risk to the safety of planes as well as endangering the lives of the slum dwellers. Muungano Wa Wanavijiji and local residents believe that there is more that meets the eye. The residents were being evicted because private developers with powerful political connections have acquired the land illegally. Close to 80,000 people have been left homeless after six bulldozers flattened their houses at Kyang’ombe village off Mombasa Road in Nairobi under the watchful eye and supervision of fully armed Administration Police officers. The responsible Institution, Kenya Airports Authority (KAA) is said to have given the residents notice to vacate the area, so as to clear it and create space for aircrafts flying over before landing or taking-off from the JKIA International Airport. On seeking information and justification from KAA corporate affairs manager Dominic Ngigi, who declined to comment claiming that the matter was now out of his jurisdiction and are now in the hands of the local Provincial Commissioner and the Provincial Police Officer respectively. The evictions began at around 11pm on Friday night catching the resident’s off guard. What raises eyebrows is why did they have to conduct the forceful evictions at Midnight? Where did they expect the women and children to seek refuge? Several schools were also demolished, the schools which also served as examination centers are now facing dilemma over the candidature of their already registered candidates. 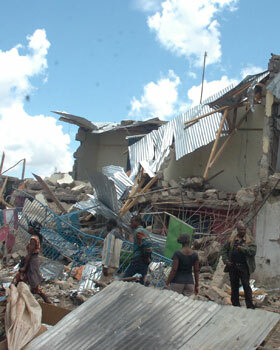 More than ten schools, a number of churches, garages, bars, shops and other businesses were destroyed. Some of the residents managed to secure their household items from the bulldozers’ path but a number of them had no time to remove their items, which were destroyed as the houses were being flattened. By Saturday morning, about 1300 houses were already destroyed in the melee as the bulldozers advanced towards more than 4000 household units as desperate residents continued to remove their household goods away from the path of the bulldozers. More other houses beyond the scene of the current evictions have also been earmarked for further demolitions. Most of those persons evicted work as casual labourers in the nearby factories in Nairobi’s Industrial Area and had moved there for easy access. Permanent houses with shops, mini-supermarkets, concrete apartments and other semi-permanent house build from corrugated iron sheets were not spared either. Some of the residents that we managed to talk claimed they never saw any eviction notice but just heard rumours of the impending evictions since the residents had secured a court order against KAA not to go ahead with the secretly planned demolition in Kyang’ombe. “I do not know where to go. I have lived here for the past four and a half years,” Kepher Otieno said adding that he and his family have never received any notice to vacate. “There was no written notice,” he said. He was guarding his household goods together with his wife and a two-year old son and a three months old daughter. The prevention of evictions and the enablement of secure tenure remain central objectives of the Federations and emerging Federations linked together through SDI. One of Muungano Support Trust’s important goals is to demonstrate to communities, professionals, city officials and politicians that alternatives to evictions can emerge from the development of negotiated consensus. In order to achieve this consensus the key development actors - organized communities and local governments need to shift perspective and think beyond an "either/or" scenario. From the perspective of communities this normally manifests as "either we win the right to stay where we are, or we do not cooperate". From the perspective of the city it is a case of "either we relocate you, or you don't get any development." This takes a lot of negotiation. In most cases communities under threat of eviction and state institutions who support these evictions, are in no mental state to negotiate anything. Over the years the Kenyan slum dwellers federation Muungano Wa Wanavijiji with the assistance of Slum Dwellers International have developed, refined, adapted and transferred a set of tools that are used to pre-empt evictions and move cities from demolition to development. They include. Community Enumeration. When poor people count themselves it is a great mobilization starter. And as the communities gather more information and learn how to process and use it they get to be equipped with the information and the understanding required for resettlement and upgrading. This is a crucial step in moving poor communities from being victims to becoming direct actors in change. Settlement Mapping. An important part of this data-gathering is the drawing of settlement maps that include houses, shops, pathways, water-points, electric poles and so on. This helps people to get a visual fix on their physical situation and enables them to plan settlement improvements and to assess the development interventions that outsiders propose. Detailed, accurate, and first-hand these maps are powerful planning and mobilizing tools and also effective bargaining chips when it comes to negotiations for secure tenure. Surveying Vacant Land. It is not uncommon for city authorities to dismiss arguments in favour of low cost housing by saying that there is no available land in suitable locations. Whilst public land is often limited and whilst market forces make private land unaffordable for the poor, Federations in many southern cities have demonstrated that these realities do not translate into a situation in which there is no suitable land for poor people in the inner city or in areas with easy access to public amenities. Federations in countries such as South Africa, Cambodia, Kenya and India have embarked on elaborate land identification exercises that have ranged from picnics on open land in Mumbai to land audits in Durban and settlement profiling in Nairobi. Settlement Planning. It is necessary for poor communities to re-locate their participation in the housing delivery process at the level of the practical. This means a move away from the abstraction of a struggle for housing rights, backed with lobbying, demonstration and litigation to the concrete activities of planning, design and actual delivery. In order to do this, communities need to start by dreaming and visualizing the kind of settlements and houses in which they would like to live. From this point onwards it is relatively easy for community members to break the myth that planning and design are the exclusive domain of highly trained professionals, and that regulation and monitoring are the sole prerogative of officials and bureaucrats. Over the years the SDI affiliates have developed effective community based training programmes in which households in affected settlements come together to plan their settlements and design their houses. These programmes vary from country to country but share several key elements. They are dreaming or visualizing neighbourhoods and houses, moving from the abstract to the concrete by means of cloth house models and the creation of basic layout designs. This is followed by the evolution of a common community vision in terms of house type and settlement layout, which is reflected back to the communities through mass meetings and through sustained dialogue within already established savings collectives. House Model Exhibitions. Many SDI affiliates scale up their cloth models until they become full scale models, normally constructed with timber frames, cloth walls and galvanized roofing. When politicians, officials and other communities are invited to see these physical manifestations of the people's plans, a lot of interesting things normally transpire. Possibilities are democratised, excitement and self consciousness is generated, city authorities begin to see communities through different eyes, people begin to take ownership of their problems and their solutions, and citizenship is deepened. Building Networks via Community Exchanges. A programme of constant exchange visits between settlements in the same city, in different cities and different countries has resulted in the transfer of these and other rituals and skills to thousands of slum settlements all over the world. The absorption of these capacities into new settlements provides them with tools that they will need in their own struggles for land, secure tenure and affordable housing. Together with the transfer of knowledge comes the growth of unity and solidarity, resulting in a stronger voice of the poor, at city, country and international level. This in itself becomes a vital tool for tenure security that SDI forges for its urban poor affiliates. The people of Kyang’ombe have nowhere to run to. This is an unfortunate event that has cast dark clouds on their lives and those of their children. According to the Constitution and the Millennium development goals, the Government is entitled to provide its citizens with proper shelter for its people. We cannot understand why the evictions were conducted without proper planning for those who were to be affected by the demolitions.